Huawei Y9 2019 Launches in Kenyan market – Kenyatta University TV (KUTV). All Rights Reserved. 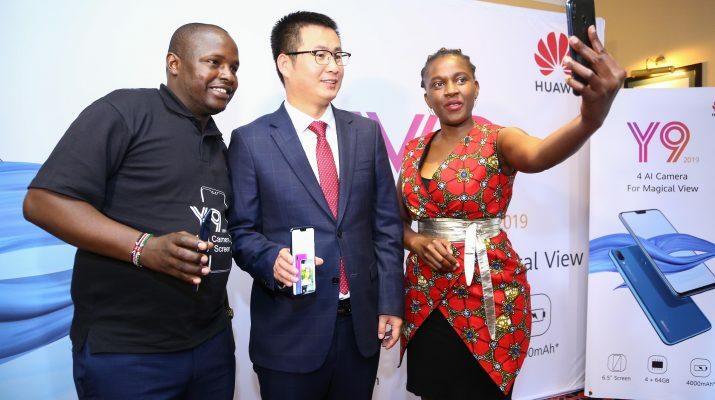 Global technology firm, Huawei Technologies, has launched the new Huawei Y9 2019 mobile device in the Kenyan market. Through the firm’s local mobile division, Huawei has unveiled the innovative high-tech phone packed with the latest power saving technology. The new Huawei Y9 2019 device features an upgraded Central Processing Unit (CPU), front and rear dual camera, and the notched HUAWEI FullView Display. Locally, the new HUAWEI Y9 2019 will be retailing in the Kenyan market for Kshs24,990 at all leading consumer electronics retail stores as well as on the Jumia Online retail platform. The launch of Y9 2019 that comes with a new notched 6.5inch full view display is part of Huawei’s efforts to push boundaries in the smartphone industry by improving user experience through advanced technology. “We are delighted to announce the arrival of the Huawei Y9 2019 into this market. We believe that it will be a favorite, mainly amongst Kenyan youth due to its favorable price and superior features,” said the Huawei Head of Eastern Africa Mobile Steven Li during the phone launch. The phone, which has three key superior smart features; battery life of 4000mAh, memory of 64GB in addition to a front and rare dual camera is available for pre-order from today, to be culminated with a public launch on 27th October 2018, at Two Rivers Mall and Thika Road Mall. Cooperation where we surpassed Apple to be the second in global smartphones sales and increased market share,” added Steven. Consumers are encouraged to pre-order via Jumia by signing up on their site as well as offline in our retail stores. The pre-order comes with an attractive gift hamper that is worth Kshs 8,000.